Was there any significance as to how Jesus' body was wrapped? Dr. Reagan: Let's take a look at the New Testament tomb. It was a classic rolling stone type of tomb. Dr. Fleming: Yes, and it would have been quite big. Joseph of Arimathea was one of the elders, which means a member of the Jewish ruling Sanhedrin. Archaeologists have discovered some tombs in Jerusalem with this same large entry stone, so we know the tomb Jesus was put in must have been a wealthy tomb. The entry stone rolls uphill to open. It would be easier to close the tomb than open it. Because opening was going to take a lot of pushing, that's why the women who came to prepare Jesus' body were wondering who would help them push back the stone. Usually a wealthy Jewish tomb's entryway was decorated with floral or geometric designs. Outside of the tomb, there would be a mourner's bench. For one week you would visit the tomb daily and you would cry. There were even tear vases or tear cups that they would use to collect their tears. That way the mourners could inter their grief by putting the tear cup into the tomb. Archaeologist have found many tear cups in the tombs. The act is about burying your grief with your loved one. There are even mentions of these tear bottles in the Bible. After coming up a flight of stairs in our tomb here at the Center, we enter the anterior of the tomb. In order to have people be able to view the inside of the tomb easier, we've made it so there are three fully preserved niches and two of these niches are preserved though the roof "broke" and later "collapsed" for ease of viewing externally. There would be three more niches running in other directions. In front of the niches is a U-shaped bench on three sides. That's where you would dress the body and then afterwards slide it into a niche. At the Center we have one sort of example "body" to see. 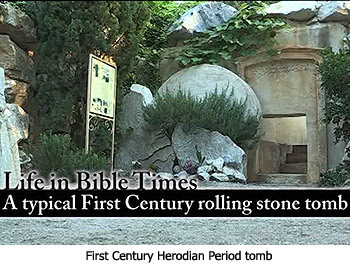 The tomb of Christ is a typical Herodian Period tomb. These kind of tombs were only found in Jerusalem from 37 BC to 70 AD, which is a very restricted period. 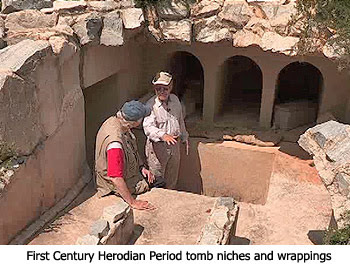 Because of the timing, they're called Herodian Period tombs. Dr. Fleming: You can imagine then that Friday Jesus' body would have been brought up to the tomb, but not yet slid into a niche. He would have simply been laid on the bench because due to the Sabbath the women couldn't work and so would have had to return to the tomb on Sunday to add grave cloths and spices. Usually the women would be bringing grave clothes with the body. Possibly Nicodemus and Joseph of Arimathea may have been bringing a mixture of myrrh and olives and some grave cloths as well so that they could have wrapped the body with the spices. But, the Sabbath was coming so they couldn't properly prepare the body for burial. Remember the Scriptures say as they exited the tomb the Sabbath was being manifest, and that means the Jewish people were lighting their oil lamps just before the sunset. It wouldn't be then the tradition of the women to come back on Saturday. At the first light Sunday morning, the women wanted to add more grave cloths because they didn't have enough time before sunset Friday night to properly prepare Jesus' body. So, here they are coming back to the tomb wondering who would help them roll back the massive stone that covered the entryway. Anyone familiar with the Resurrection story knows the stone was already rolled back when they got there, and so we have this mystery of the resurrection narrative. Let's mention a bit more about burial practices. Those tending the body would wrap the body from foot to head. Notice they'd have to tie off the shoulders and then come around again and start with the head. The head was a separate wrapping from the body. That separate head wrapping is mentioned in John 11:44 and the Gospel narrative of John 20:7. If someone had just stolen Jesus' body after unwrapping the grave clothes, you'd expect to see a jumbled pile of grave clothes left behind. Instead, the women and Apostles saw the head wrapping separately folded apart from the body wrapping. Remember that there's a little space between them because there is a tying off at the shoulders and starting anew with the head. That's significant! When the women tell the disciples, and Peter and John run to the tomb, remember John got there first. I guess he could jog faster. He stooped and looked in because the entryway was only five to seven hands high for the door. Peter when he got there walked right in, so he is the first one to witness the empty tomb. It must have been so strange a thing to see when he saw the head wrapping separate from the body wrappings. Once he saw them all neatly laid out, he finally believed. If someone had stolen the body and left the grave cloth,s there would have been just a pile of grave cloths. People back then would have understood to tie off the body and then start again coming in from the shoulders for the head. The witnesses to the Resurrection were seeing the head clothes separate from the body clothes, and that made them realize they could not explain the arrangement of the grave clothes. The body was missing, but the grave clothes were left undisturbed. Normally what would happen is that the preparers of the body would add more spices the rest of that week as the body decomposes and gets smellier. Remember in the Lazarus story in John's gospel Martha says, "By now Lazarus stinks." So, they would have added more spices for the entire week as they kept coming back for the funeral wake. They would add time for crying out on the bench out in front. Dr. Fleming: The interior of the tomb of Jesus has an arrangement of a U-shaped work area inside. The angel part of the resurrection narrative was there, one angel sitting at the head and one at the foot. Their positions showed the body had not yet been slid into a niche. A niche again is made to hold the body in a family tomb, and so the body would slide in headfirst. The climate in Jerusalem would take about two years to decompose a body. 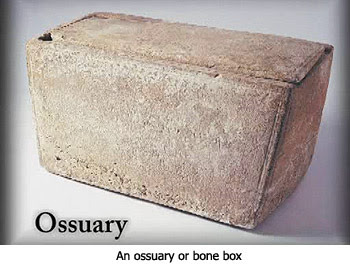 So, the plan would be at the end of those two years to come back and collect the bones and put them into a bone box called an ossuary. The proof of the resurrection of Jesus however is not just found in the folded arrangement of the grave clothes, which could not be explained. Rather, Jesus' followers turned that First Century upside down. They should have returned to their nets had the resurrection not occurred, but instead they turned the First Century upside down. It was the early disciples' belief in the Resurrection that kept them serving God. It kept them even in spite of danger and persecution. They were willing to give their lives in obedience to God's will, sharing the Gospel throughout the Roman world. 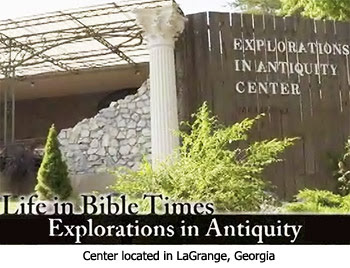 In the seventeenth and last part of this series with archaeologist Dr. James Fleming at his Explorations in Antiquity Center, we'll glean some biblical insights by looking at the economy of First Century living. Just ordered this series on DVD...Merry Christmas, Billy! I'll be going out of town for Christmas and away from internet access so I want to wish Dr. Reagan, Nathan, L&L staff and your families, and all those who post and read here and blessed Christmas and a happy and healthy new year! "See" you when I get back...unless the Rapture happens next week...then I'll see you then! And a very Merry Christmas to you all, my Brothers and Sisters in Christ!!! I want to wish Dr. Reagan, Nathan, L&L staff and families, Billy, Susie, Anon and all who read and post here and your families a Merry Christmas and Happy New Year.